I was bemoaning my garden's spartan state on Sunday, and here is another floral post to cheer us up. This is a lovely piece by Walter Crane, an artist who reflected that delicate illustrative style of the Aesthetic period. I seem to remember that my mother had a number of plastic Christmas roses for flower arranging purposes. My mum was a brilliant flower arranger, who always made the most lovely displays for the tables at this time of year. I remember going on walks with her to gather holly, ivy and evergreen foliage which she assembled into the most splendid shapes and forms. I have a basic understanding of how you do it: it's far more complex than ramming stems into that weird green block of disturbing foam, although that works too. When I was a child, my mother would enter our local flower and produce show and win prizes for her wonderful displays. I always did quite well with my 'animal made from vegetables'. Really, it should be on my cv. 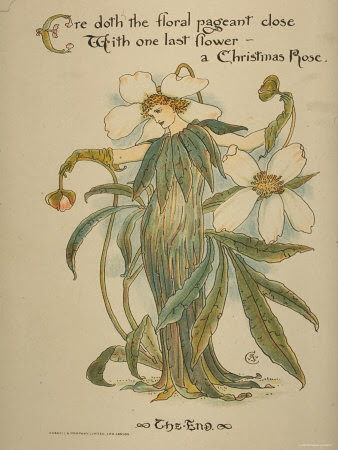 Back to Walter Crane's Christmas lady. The 'pageant of the flowers' ends with the Christmas Rose, a flower synonymous with December. Her pure white headdress reflects snow and purity and her robes of green speak of life in its essential form. I find those colours reminiscent of pre-Coke Father Christmas. The colour palette of winter is often just those two colours, for which we feel grateful in the dark of winter. The green of the evergreen boughs give us hope and are the reason we bring trees into the house to decorate. I often feel that the flowers of winter need to be white, to provide a pure light in the darkness. It's unsurprising that some of the most hope-filled festivals happen in the darkest months and much of our rituals involve lights, candles, glittering reflective decorations. Each sparkle tells us that Spring will come again. Still, there also is a sense of purity and austerity in Crane's rose that also seems appropriate for this time of year. In some ways the idea that we should spend the entire season eating and drinking ourselves into a stupor is unsurprising given that the dark and cold touches something primal in us. We fear the dark deep down and by gathering food and drink to our merry little caves and defy the endless night by enjoying ourselves. I'm alright before Christmas, I have something to look forward to, something to plan, but I get rather wretched in January. Unless there is snow, I do love a bit of snow. Maybe a little austerity would be good for us, to make us appreciate the goodness we have. I always thought that was the point of Christmas dinner, one spectacular meal at the bleakest point in the year to remind you that what we have is enough, and enough is great riches. The Christmas Rose is a charming looking lady, isn't she? Mind you, she is rather sophisticated looking, like she would be easily bored at parties unless you were really witty. I love the way she is holding the buds of the flowers, so louche! I rather fancy her frock too but I'm not I could pull off that collar. I think I can see why she's the last flower in the floral pageant. She'd be a tough act to follow.